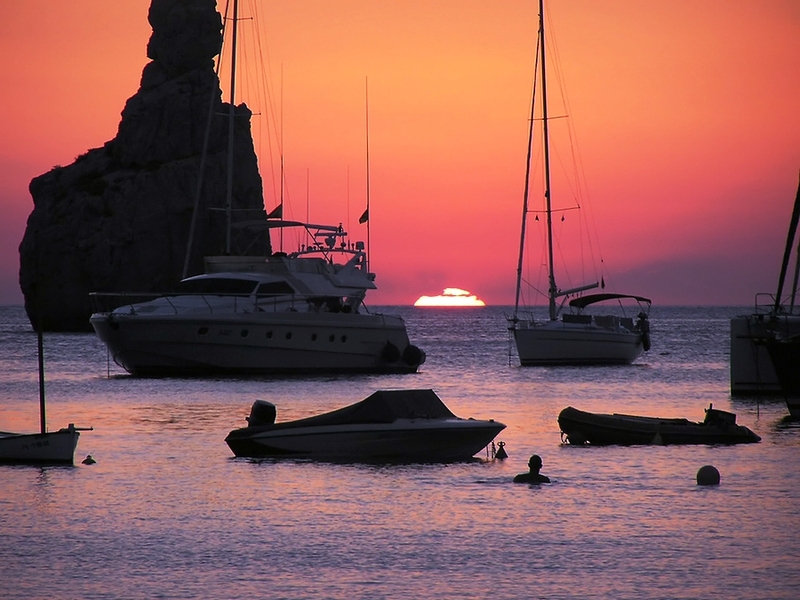 Known as the international jet set island and a place to stop on a crewed yacht charter in the port of Ibiza Town for nights out clubbing and dancing, the island of Ibiza also has a lovely traditional side waiting to be discovered on a crewed yacht charter of the Balearic Islands. 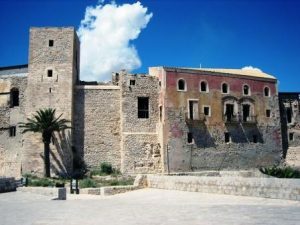 People have flocked to Ibiza for over 2500 years, with remains on the island from the Phoenicians, and much of Ibiza is designated as a UNESCO World Heritage site. With the white cubist architecture of Ibiza Town reflecting in the bright sunlight and beautiful blue clear waters, Ibiza has been chosen as the setting for a number of movies and books. 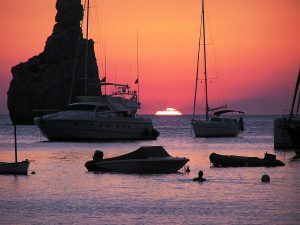 All night clubbing until sunrise (new law requires all clubs to be closed by 6:00am), is one draw of Ibiza, however the beauty of the island and the traditional little villages, beaches, and many anchorages are another draw for a visit on a crewed yacht charter of the Balearic Islands. 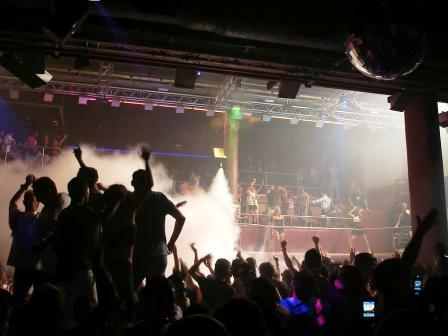 The night club scene is a big international draw for visitors to Ibiza, particularly to the main port of Ibiza Town. The season typically runs from the beginning of June with opening parties to mark the beginning of the season, to the first weekend in October, with closing parties to mark the end of the season. 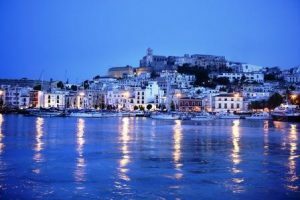 And clubbing in Ibiza Town is an all night affair, starting with pre parties to watch the sunset, night clubbing and disco dancing, and then sunrise parties. A popular bar is Café del Mar, and popular night clubs are Privilege, Amnesia, and Space, where disco dancing goes until dawn. 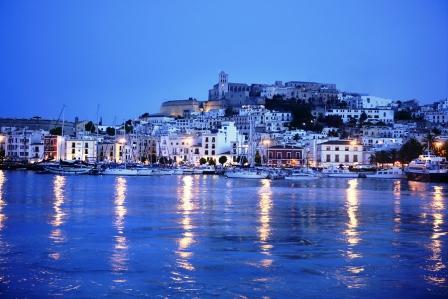 While most night life on Ibiza is centered on Ibiza Town, the smaller town of Sant Antoni also has a night club scene. 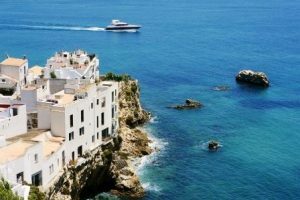 Outside of Ibiza Town, the rest of the island is gorgeous with high cliffs surrounding little bays with beaches and crystal clear water. This pine covered island has a tremendous amount to offer. And watching the beautiful sunsets is an activity around the island, and not reserved just for the night club set. Inland are almond tree plantations, and orange and lemon groves, along with numerous olive trees, and growing wild across the island are rosemary, thyme and heather, with the fragrant oils released by the ever constant winds. Secluded coves are easy to find for swimming or sunning on the beach. Hiking, horseback riding and mountain bike riding are popular on this island, as is swimming, scuba diving the caves and wrecks, and sea kayaking in the many coves. On shore, visit La Selinas, the famous salt flats of “white gold” where salt has been collected for over 2000 years. Visit the Can Marca caves, finding in the center a 30’ waterfall. And in Ibiza Town, visit Dalt Vila, a medieval castle with several gates, complete with a drawbridge. And before leaving Ibiza wander through one of the infamous Hippy Markets. Drawn to the island in the 1960’s for the beautiful light, artists, painters and designers and others seeking freedom of expression settled in and as an outlet for their wares, developed the Hippy Markets selling handmade clothing, jewelry, art, and crafts, and now also selling imported goods from around the world in little stalls that are set up in the market areas. And as with any festive atmosphere, in and around the Hippy Markets, you may see mimes, musicians, stilt walkers and others looking to be supported for their personal talents. 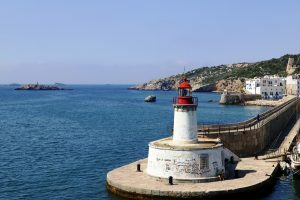 Include Ibiza Island in your crewed yacht charter of the Spanish Balearic Islands, not only for the international jet set night life, but to enjoy the beauty of the island and to pick up a souvenir at the Hippy Markets.